And that’s the most significant feature of its 2007 regulation adjustments: diesel-engined cars will compete with a tank 10% smaller than petrol-engined rivals – so 81 litres. So logically the ACO is expecting petrol-powered cars, to the latest chassis regulations, to make up that 3.2 seconds deficit. 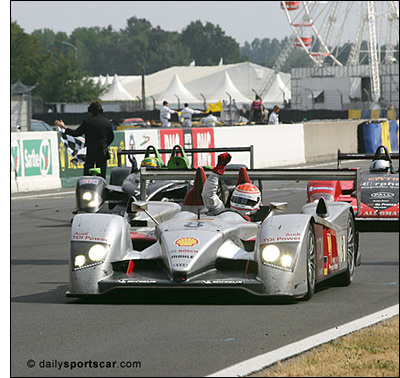 The only genuine 2006 LMP1 cars at Le Mans this year were the Courage LC70s, the Lola B06/10 and the Audis – and neither of the new cars were as fast as the Pescarolo hybrids. “Our regulations are framed in such a way as to encourage manufacturers to take up new challenges,” says ACO president Mr. Jean-Claude Plassart. “We are delighted with the recent initiative of two major manufacturers, which have accepted the challenge to race at Le Mans with a clean diesel engine. AUDI was the first to go for this technological gamble and so became the first manufacturer to win the race with diesel power in this year's Le Mans 24 Hours." Audi and Peugeot representatives met with the ACO last week. "When the A.C.O threw down the gauntlet with this diesel challenge the A.C.O. made it quite clear that it would keep a close eye on the equivalence between diesel and petrol-engined cars," the president continues. "Thus, we have been working in close collaboration with the manufacturers, the petrol companies and major independent engineers. From these studies and on-going analyses with very sophisticated simulation models and computer programmes we came to the conclusion that corrections had to be made but with considerable caution, all the more so as those in the running for victory were separated by small gaps." "First of all, for 2007 we've decided to work on adjusting the quantity of energy supplied. It's a painstaking job which is of the utmost importance as we're sure that in the future manufacturers are going to come along with new technological innovations and above all with questions linked to different forms of energy." Aiming to keep suitable lap time differences between the classes, the ACO as come up with the following for next year (below – official ACO text). NB. There’s no mention of performance adjustments during the season – and there is also an implication that the rule changes apply to the ALMS, as well as Le Mans and the Le Mans Series. IMSA has made it clear that it will review performance twice next year, probably at the one-third and two-thirds points of the season (after four and eight races). IMSA has adjusted the ACO rules in several respects this year, and seems likely to do the same again in 2007. LM P1: Concerning the adjustments to be made to performances between petrol and diesel-engined cars, the advantages and disadvantages linked to the use of different types of engines must be taken into account. After making this clear the A.C.O considers that for 2007 in the light of the results achieved this year the size of the air restrictors, the supercharger pressures and the weight of all the LM P1s should remain identical to those of the 2006 season. The gap between the quantity of energy in a litre of diesel and a litre petrol being 10% the capacity of the diesel-engined cars' fuel tanks will be reduced by this amount to 81 litres. LM P2: The performances of some of the LM P2 cars are very close to and indeed sometimes even better than the LM P1s on certain circuits so a reduction is necessary. The air restrictors will be 5% smaller. In addition, a gap of 1.5% between the best LM P1 and LM P2 laps times must be respected. If the gap is under this figure the A.C.O will take steps to re-establish it at the end of the year. LM GT1: Given that the performance and top speed of these cars are constantly increasing approaching those of the LM P2s, their air restrictors will be reduced by 5%. As the capacity of the fuel tanks has to be adjusted according to the type of energy used (petrol or ethanol; see 'fuels' below), the amount of fuel on board the car must not exceed 90 litres. LM GT2: To maintain a reasonable gap to the GT1s the air restrictors will also be reduced by 5%. As the capacity of the fuel tanks has to be adjusted according to the type of energy used (petrol or ethanol; see 'fuels' below), the amount of fuel on board the car must not exceed 90 litres. FUEL: In 2007, the ACO will supply only one kind of petrol and one kind of diesel for the Le Mans 24 Hours and the Le Mans Series events. To meet the requests of several entrants who want to use bio fuels, the ACO is currently evaluating the possibility of supplying a type of diesel and petrol in 2008 that contain a certain quantity of bio fuel. These fuels will be compatible with current engines. However, the ACO agrees that the American Le Mans Series supply a third kind of fuel based on ethanol for its events in 2007. The capacity of the fuel tanks will be adjusted in such a way that the quantity of energy will be the same whether it is petrol or diesel. For safety reasons the capacity of the fuel tank cannot exceed 110 litres.